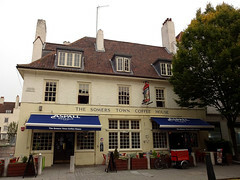 Previously a gastropub serving French food and wines, it reopened in October 2011 under the management of Yummy Pub Co, a small pub group with a few other sites outside London. It now has six handpumps on the bar and describes its food as "British tapas" (served noon-10pm every day, as of May 2012). Although the name harks back to the history of many central London drinking places, this is very much a pub. The decor is dominated by the luxurious wood panelling that stretches most of the way up all the walls, with complementary furniture, and an attractively restored island bar (toilets can be found down a corridor behind it). There are plenty of tables throughout the space, and more in front of the pub. As of May 2012, a "secret garden" is "coming soon". When Kake and friend visited on a Friday lunchtime in May 2012, all six handpulls were on, offering Waggle Dance (£1.95/half), Bombardier (£1.80/half), Courage Best, Young's London Gold, Courage Directors, and Castle Rock Diamond Reign. They also had Stowford Press cider on tap. The ales were served in dimpled half-pint jugs. We arrived a little after noon, and there were plenty of spare tables; the place filled up while we were there, but never to the point where there would have been a struggle to find a seat. Music was playing, though not too loud for conversation. The member of staff behind the bar recommended choosing 2-3 dishes per person from the small plates on their menu photo of menu as of May 2012. We tried a total of six between the two of us, which came to £13.25/head and was about the right amount. The food arrived in various pots and dishes arranged on top of chunky wooden chopping boards photo, and mismatched china plates were brought for us to share it out. Fresh mussel meat popcorn (£4.50) was well-executed; the batter wasn't greasy and the mussel meat wasn't overcooked. Potted crab and brown shrimp with toast (£5.50) was fine. A half-pint of shell-on prawns with chilli mayo (£4.50) came with quite a lot of roe in the prawns, which wasn't entirely unwelcome but made the dipping-in-mayo process a little messy; the prawns were also very slightly overcooked for Kake's taste. Roast spuds with rich gravy (£4) photo were not quite as fluffy as they could have been, but were certainly not bad, and the gravy was a generous portion and nicely flavoured. Garlic mushrooms (£4) photo were decent too, with firm-textured button mushrooms swimming in a sea of garlic butter. Honey-roast veg (£4), a combination of carrots and parsnips, were a little unevenly cooked, with some of them being undercooked but others being fine. On a Tuesday lunchtime visit under the previous management, Ewan noted that it wasn't too busy, although after work it may be more packed with local office workers. Accessibility: A step up to get in at one entrance, but only a small step at the other, less than kerb height. Step-free to bar, seating, and toilets once you're in. There is a RADAR-locked accessible toilet. Last visited by Kake and friend, May 2012. Opening hours taken from board outside, May 2012. Food times taken from menu in pub, May 2012. Last edited 2017-10-22 17:06:53 (version 18; diff). List all versions. Page last edited 2017-10-22 17:06:53 (version 18).